I know everyone probably wants another post with some baby news/info, so let me do my best to see what I can come up with, in more of a freestyle format. We found out we were pregnant on October 7, when I would be considered a little bit over four weeks. I took four tests in succession because I wanted to be sure. 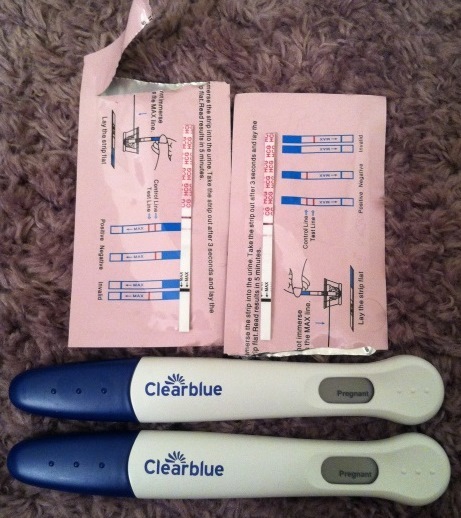 We told my parents and grandma immediately, then didn’t breath a word to anyone else until it was confirmed by my doctor on October 10. We told the rest of my family when we went back home to New York for the Rock ‘n’ Roll 10K, then Jay’s family when we saw them in person the following weekend, after they got back from San Diego. I have only gotten dizzy to the point of thinking I was going to pass out twice, both times were before I knew I was pregnant. One time was when I was in Target after getting my haircut on October 2, but I thought it was because I had had a glass of wine at the appointment on an empty stomach (oops). The second time was on the morning of October 6, when I suddenly got sweaty and dizzy and felt like I needed fresh air or I was going to pass out. Us buying the house had nothing to do with us having a baby. Like I said in my previous post, we had no intentions to buy a house. It just kinda happened, but it happened for a reason. 🙂 We got the house in early August and officially became its owners on September 10; I didn’t even get knocked up until around September 22. 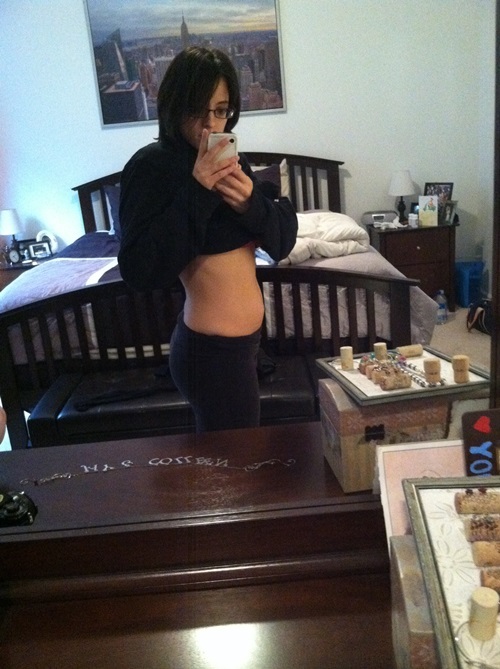 No morning sickness at all. I never threw up once. I got queasy in the evenings, starting around 6-7 p.m. Thank goodness Pure Barre has lunchtime classes five days a week! 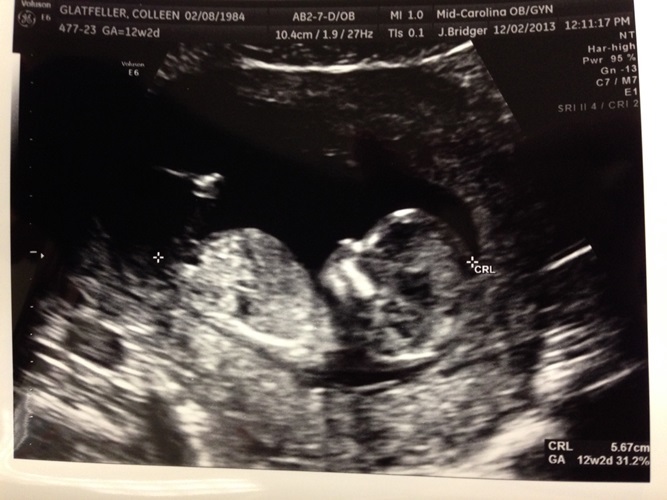 We had our first ultrasound to date the pregnancy on October 24. Since I had so little symptoms, I was convinced that there was nothing actually in there. Thankfully, I was wrong. If I didn’t eat as soon as I was hungry, I would feel queasy, like I was going to be sick. From weeks 6 through 11, I ate constantly. Around 6-7 p.m., I’d start to feel like I had been hit by a ton of bricks. I wasn’t sleepy, I just had zero energy. Jay picked up the slack a lot during the first trimester and for that, I am so grateful. I felt awful at how lazy I was being. I slept through the night almost every night for the first time in years. Not even a full bladder could wake me. It was glorious. The full bladder wakes me now, though. No food cravings, but I did give into my life-long desire to eat bagels for lunch every day. This lasted a week until my brain took over and I realized I was eating bagels for lunch every day, lol. I had a fair amount of cramping, which I know is normal, but it was still unnerving and freaked me out a lot. I am due on June 14, 2014. This is particularly special because my grandfather died on June 12, 2013. To ease some of my fear at my lack of throwing up all the time, I bought a Sonoline B Handheld Fetal Doppler so we could hear Baby G’s heartbeat. Best decision ever. Jay and I first heard the heartbeat when I was 9 weeks. Being able to give my family a way to hear the heartbeat last month was the most meaningful moment of my pregnancy thus far. We find out the gender on December 21. Our early guesses: I think Baby G is a boy; Jay thinks Baby G is a girl. I am shocked at how many people’s first question to me upon finding out is something along the lines of, “Was it planned?” I don’t think it’s really anyone’s business, but I keep awkwardly answering it because I’m more afraid of being rude if I respond how I really want to answer. I cried when Jay finished a box of Oreos last week. I didn’t miss booze until around week 10. Now, I really miss wine and beer. I’m not planning on doing the weekly belly shot updates. I’ll take one per trimester to compare the differences. Most likely, they’ll be here and not on Instagram or Facebook. At least, not for a while. I took four tests in a row. “Belly” at 5 weeks, taken on Saturday, October 12. Forgive the mess; I took this at my parents’ house at 4 a.m. before we left for the R’n’R 10k race. Baby G’s first picture. Sonogram establishing my due date on Thursday, October 24, 2013. We celebrated by going out to buy our dining room table, lol. From our 12 week ultrasound appointment. 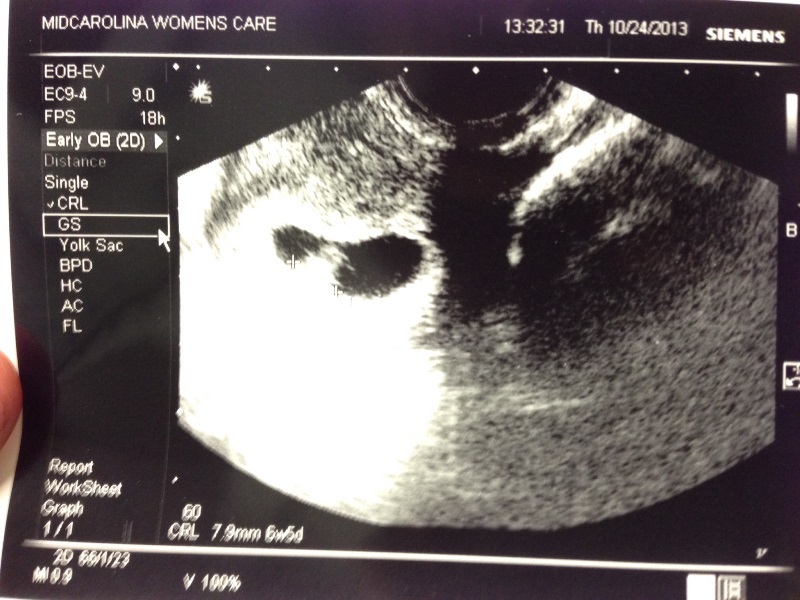 This was an “extra” ultrasound because we opted to do the nuchal translucency testing. Belly 13 weeks, taken on Sunday, December 8. I should note I took that the morning after eating for twelve at my office Christmas party the night before, haha. This entry was posted in Baby, Jay Glatfelter, Married Life. Bookmark the permalink.